ఈ హెయిర్ స్పాతో.. అందమైన జుట్టు మీ సొంతం! 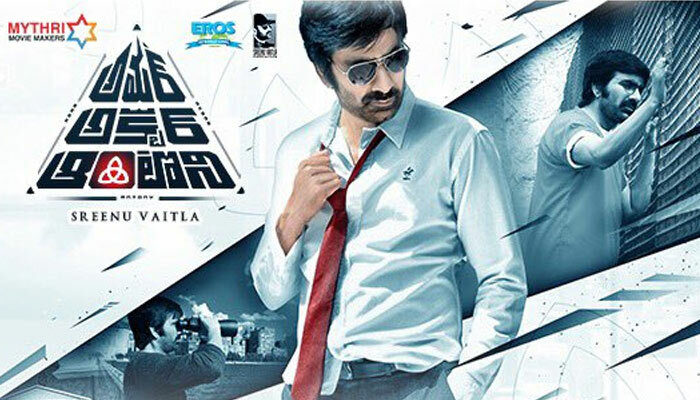 Actors: Raviteja, Ileana, Vikramjeet Virk, Sunil, Abhimanyu Singh, Sayaji Shinde, Tarun Arora, Laya, Adithya Menon, Srinivasa Reddy, Vennela Kishore, Rajveer Ankur Singh, Jaya Prakash Reddy, Tanikella Bharani, Raghu Babu, Subhalekha Sudhakar, Ravi Prakash, Bharath Reddy, Satya, Abhirami and others. Amar Akbar Anthony Punchline: Vaitla, You DID It Again! Successful combination of Raviteja and Srinu Vaitla teaming up for high budget entertainer bankrolled under Mythri Movie Makers generated enough buzz for Amar Akbar Antony. The film also marks Ileana’s return to Tollywood. Will Raviteja, Srinu Vaitla and Ileana come out of flop streak with this triple treat? Amar (Raviteja) suffering from Dissociative Identity Disorder (DID) with two other different personalities Akbar and Anthony is on a mission to present revenge as return gift for four culprits behind his haunting past. What is his unforgettable past? What is his connection with Pooja (Ileana), one more DID patient and Jalal (Sayaji Shinde)? To begin with, Amar Akbar Anthony is definitely not a unique film as told by Srinu Vaitla and co. One could find easy connection of AAA with few hit movies like Aparichithudu, Athanokkade and Dookudu in different stages of storytelling. The outcome is deplorably unpleasant. Better screenplay would have at least satisfied those who enjoy regular commercial films. The young writing team Srinu Vaitla employed has zero sense of hilarity and null emotional sensibilities. Hence, it’s proved again that Vaitla, when he has no potential writers in team cannot stand tall. SS Thaman came up with routine stuff to make this mind-numbing narrative more generous with background and main score. Songs are noisy. Cinematography by Venkat C Dileep is obviously one of the rarest positives whereas editor’s final cut is as perplexing as Christopher Nolan’s films. Production values of Mythri Movie Makers are as usually top notch and spotless. Onto performances, Raviteja offered triple torture. Look wise, he was cool but on performance front, he was not the same mass maharaja and most energetic star type. Neither we could find any variance in outlook nor did he come up with different mannerisms to discriminate three different roles. Ileana too looks awful with heavy makeup. Moreover, she disappoints her die-hard Fans with no navel show. Only Sathya shines partially imitative KA Paul amongst the entire comedy batch of Vennela Kishore, Raghu Babu, Sunil, JP and Srinivasa Reddy. The villain batch is constrained for styling. Sayaji Shinde, Abhimanyu Singh got lengthy worthless role. Yesteryear heroines Laya and Abhirami were completely wasted. Banked on an evergreen Bollywood classic title, Srinu Vaitla made sure that his product carried enough buzz from very beginning. Unfortunately, this AAA is no match either content wise or conviction wise. Vaitla seems to have forgotten every basic component of script and direction thus making AAA one more addition to his forgettable list. Right from the go, entire story and narrative went wrong. Except grand visuals traversing through the USA locales in top shots blended with inferior green mat shots, there is nothing eye candy. If Vaitla thinks Dissociative Identity Disorder (DID) is the fresh point to entertain on Raviteja, then he is nowhere close to contemporary audience. Slaughtering every episode in his own unbeatable style, we are compelled to assume as if Touch Chesi Choodu, Mister and Savyasachi are far better than AAA. Beginning the film on hero and heroine childhood episodes, the upcoming revenge based action, drama plot is hinted. Once story shifts fast forward by 14 years, Raviteja as Amar accomplishes the first killing. Soon, the WATA (Whole Andhra Telugu Association) setup developed for fun to work on JP, Srinivas Reddy, Raghu Babu, Vennela Kishore, Sathya and others worked to an extent. Entry of Ileana and the complexity involved in changing of Amar as Akbar and Anthony is silly at execution. In parallel, Ileana is also explained to be suffering with DID just like Raviteja as they are victims of a common flashback. While Akbar’s slang is irksome, Dr Marc Anthony’s act is strongly displeasing. On the other hand, Abhimanyu Singh’s FBI investigation is grievous followed by interval is simple and confusing. Second half gets far further painful. Sunil’s entry as illegal immigrant is ignorable though he continues long joining the WATA gang. Sketches for the killing of remaining main culprits and entry-exit of Akbar, Anthony from Amar are a test for patience. All the top comedian team together in FBI cell being made Bakras by Amar is Vaitla brand template treatment. Sayaji Shinde trying to tie all the loose ends paves way for an action climax. All in all, AAA is badly made regular Vaitla film with contrastingly, hard to connect USA backdrop. Except Raviteja’s performance and lavish visuals, each and every bit of AAA is crippled in Vaitla direction. Thus AAA is an uneven grind of Aparichithudu, Athanokkade and Dookudu. CJ goes with 2 stars and Mythri should work hard to forget these sour results. With no other significant films to grace theaters in coming weeks until 2.0, Box Office result has to be wait and seen. కోరుకున్న కెరీర్ ని ఎన్నుకోవడం ఎలా? తొలి వన్డేలో టీమిండియా ఓటమి.. రోహిత్ శతకం వృథా..